If you’ve been visiting WineWeekly for a while then you’ve seen several reviews of Macari wines from Long Island, NY. I’ve yet to be disappointed by a Macari bottle, and this is no exception. Nose is a bit unusual, as there is an element I can’t quite identify, except that it’s something I normally associate with well-made homemade wine. It’s kind of like overripe pear — though, not off-putting or anything, just not something I expect to smell in a Sauvignon Blanc. After sitting in the glass for a few minutes, a lovely pineapple scent dominates the aroma as that pear rounds out. The taste is not like the nose, and there is plenty of Sauvignon character. However, those who usually don’t like Sauvignon Blancs that are too “grassy” or “vegetal” will be pleased to pass this over their palate — because it is more of a ripe, warm, and citrusy Sauvignon, without any of those green / “cat pee” characteristics. The texture is surprisingly smooth, with an almost creamy mouthfeel. Acidity is fairly mild for a Sauvignon, but there is enough to pair with mild fish and poultry dishes. Depending on where you shop, you should be able to find this wine for somewhere around $19 – $25. You can also purchase it from the Macari Vineyards website. You can read another review for this wine by Lenn Thompson at New York Cork Report, and reviews for the 2010 vintage of Macari Sauvignon Blanc “Katherine’s Field” at East Coast Wineries, The VIPTable, New York Cork Report, and A Wine Story. I like sushi. Check that: I love sushi; I would eat it 5 times a week if I could afford to do so. Generally, a good sake remains — for me — the best match for most types of sushi, particularly if I’m having spicy rolls and/or laying on the wasabi heavily. But, I’m not quite as educated on sake as I’d like, and sushi is as good a reason as any to open up a white wine from my rack. Recently, I opened up FOUR whites with a selection of salmon sushi (regular sushi piece on white rice, an avocado and salmon roll, and a “double salmon” roll). And, all four worked pretty well — and, I think they’ll work with other types of sushi, such as tuna, raw shrimp, yellowtail, scallop, fluke, etc. This is typical Albarino in that it has a distinct mineral quality, good acidity, and white fruit — these elements come straight from the alluvial, granite, slate, and sandy soils of the cool and wet Maritime climate of the Rias Baixas region of Galicia, Spain. The mineral character is an obviously perfect match with just about all seafood. Disclosure: this wine was sent to me as a press sample. Generally, I wouldn’t have given this wine a second thought, based on principle: to me, “Pinot Grigio” comes from Italy. Further, I usually shy away from purchasing mass-marketed wine brands at a retail shop — not necessarily because I’m a snob, but because there are so many other interesting wines to choose from at a good wine shop, and I have plenty of opportunities to taste wines from the “big boys” at chain restaurants with bad wine lists. But, again, I must disclose that this wine was sent to me as a press sample, so I felt obliged to give it a try. As expected, it doesn’t have the racy acidity nor mineral qualities one would expect from a “real” Pinot Grigio from northern Italy. 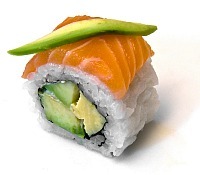 But, its round, slightly melon-flavored California character is actually a good match for the lean salmon sushi. Like the Woodbridge, Dogajolo is a bit fatter and rounder than an Italian Pinot Grigio, making it a good match for sushi (and other lean dishes). This wine is actually from Italy, but it’s a blend of Chardonnay, Sauvignon, and Grechetto. The Chardonnay gives the roundness, good weight, and a mild ripe pear flavor; the Sauvignon provides some acidity, citrus, floral notes; I’m not sure what the Grechetto brings, since I’ve never had a pure Grechetto. Disclosure: I work for the company that imports this wine (Opici Wines). This was the most expensive of the four and, not surprisingly, the most complex. Like the Pinot Grigio, its California roots came through — round, good weight, more pear and floral aromas than the green, grassy, “pipi du chat” character you get from French Sauvignon. The flavor was dominated by pear and lime with a hint of spice, and the acidity was mild. It worked very nicely with the salmon sushi, and I think it would work even better with more flavorful sushi such as eel and mackerel. Again, full disclosure: this was received as a sample. If only a sushi company would send me samples as well, I’d really be in business! Next time I’ll get a more interesting array of sushi dishes and try more whites. Meantime, what wines do you enjoy with sushi? Share your thoughts in the comments. What makes a wine “wild fermented”? Without going into too much detail, it means the winemaker chose let the wine ferment of its own accord, catalyzed by yeasts existing on the grape skins and in the winery. For those who don’t know the intricacies of winemaking, most wines — generally speaking — are fermented after the winemaker introduces an externally obtained yeast to the grape juice. Does it make a significant difference, which way the wine ferments? The jury is out, but there are arguments for both sides. Further, there has been some interest recently in “wild fermented” wines, as they are seen by some to be produced more “purely” or “naturally”. Whatever. Personally, I don’t care, as long as the final product tastes great. Though, I do kind of like the sound of “wild fermented” — makes the wine seem more exciting, somehow. The nose is bright and expressive, with perfumey floral notes mixing with pear, grapefruit, and a hint of something that can only be described as nail polish remover. That may sound bad but in fact it didn’t take anything away from the aroma — if anything, it added a bit of complexity. In the mouth you get white citrus fruit with some mineral notes and ample, bright acidity. The finish is pleasant, offering mild fruit, more mineral, and chalky acid coating the inside of the cheeks. It is enjoyable on its own but also good with food. Try it with sushi, mildly seasoned white fish, pasta salads, raw vegetables, and simple cheeses. At $21.99, it’s kind of pricey for a Sauvignon Blanc but I would say the price is fairly commensurate with the quality — it is on par with an entry-level Sancerre or similarly priced Sauvignon from New Zealand. Now, the caveat … I can’t say for sure if this wine is available. I received the bottle from Wines of Chile as part of a Sauvignon Blanc blogger tasting from a few months back. However I can’t find it listed on any of the big retail-finding directories, and there is no info at all about the wine, neither on the Valdivieso website in Chile (warning, it’s made in Flash, grrrrr…. ), nor from the US importer Laird and Company. So maybe it’s a brand-new product, or maybe it’s always been made but never before imported. Perhaps the blogger tasting was an opportunity to test-market the wine, who knows. In any case, if you do see it, and don’t mind paying over $20 for a Chilean Sauvignon Blanc, it’s worth trying. Wow … a few of the under-$20 deals ran out quickly on Wine.com. No biggie … here are my choices for the best values available on the site for under fifteen bucks. Remember you must order TODAY to take advantage of the one-cent shipping deal. Click on the wine name to order directly from Wine.com. I described the 2006 vintage of Jip Jip Rocks Shiraz as a “beast”, and expect a similarly full-flavored, bold structured, jammy bottle of juice in the 2007 edition. Tiefenbrunner doesn’t sound Italian, but it is. Pinot Bianco is Italy’s version of Pinot Blanc, and this is one of the leading producers of the grape from the Trentino – Alto Adige region. A fresh, floral, light, and elegant white with just enough acidity to match with a variety of dishes, it’s an easier drinking alternative to Pinot Grigio and an ideal wine for the Thanksgiving table. Ho-hum, you may say … a mass-market brand, a boring California Cab. To me, though, Geyser Peak is among the best and highest quality of the volume producers, and in fact makes some outstanding, world-class wines in the upper price ranges. And though I tend to be an a constant hunt for hidden gems, there’s something to be said for a brand that can be found just about anywhere, consistently delivers solid wine, and offers good value for your money. Geyser Peak is one of those “count on it” labels, and their Cab is an approachable yet fulfilling wine that matches well with beef and cheese – based dishes. The $13.99 price tag is a good $5 – $7 below what you’d normally pay at any retailer. Like the aforementioned Cab, this is another “count on it” wine with a current sale price about $5 – $7 below what you’d normally pay. If you like New Zealand Sauvignon Blanc, particularly from Marlborough, then this will please your palate — it is a standard-bearer for the category. Fresh, clean, zesty, and full of ripe limey and tropical citrus flavors, this Sauv-Blanc is a tasty, creamy drinker on its own and really comes alive when matched with food. Try it with crabmeat and other shellfish, spicy dishes, poultry and pork.